The Battle of Beersheba took place on 31 October 1917, as part of the Sinai and Palestine campaign during World War I. 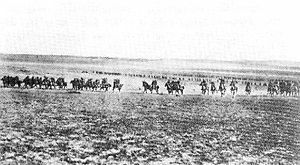 The highlight of the battle was the now famous charge of the Australian 4th Light Horse Brigade, which covered some six kilometres to overrun and capture the last remaining Turkish trenches, and secure the surviving wells at Beersheba. In the Third Battle of Gaza, it was again Chauvel who had the critical role. Chetwode believed that the EEF did not have the resources to defeat the Turks in their fixed positions so he planned to drive the Turks from them by turning the enemy flank at Beersheba. Beersheba lay on the edge of the enemy line, in a waterless area. The Desert Mounted Corps would have a long overnight approach over waterless desert and would have to capture the town quickly with its wells intact or perish from thirst. Once again the battle went right down to the line, but the mission was accomplished, albeit not without a wild mounted bayonet charge by the 4th Light Horse Brigade—the last of history's great cavalry charges—to capture the town and its vital water supply. Few battles have been won in such spectacular fashion. For this decisive victory, and the subsequent capture of Jerusalem, Chauvel was created a Knight Commander of the Order of the Bath (KCB) in the 1918 New Years List.